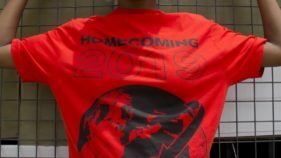 It’s about time to acknowledge one of the most intricate trends that have graced the fashion scene recently, particularly in its ability to customise the look of a regular plain outfit. We are talking about embroidery which is a method of decorating fabrics with a needle and a thread. 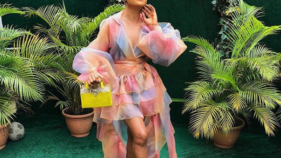 Designers have carried the onus and run along with this trend with the likes of Nigerian brand Dzyn creating stellar pieces from it, thus making it all too easy to spot the “dzynbabes” around the world. This trend crosses over styles and aesthetics, which make it versatile and really a trend that everyone can get into. Embroidery has arrived as a statement accompaniment on bomber jackets and denim wear. 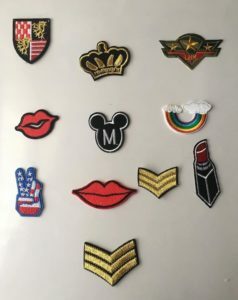 You must have spotted someone walking around with some of these embellishments plastered across their jackets or their jeans, looking super cool. 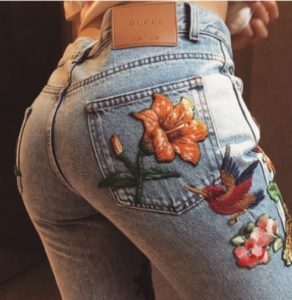 This trend says a lot about the apparent nostalgia of fashion because the 90s are back and in this case, the skittishness of high school makes a comeback in high fashion by way of embroidery. But it’s not so playful depending on the personality wearing it and the designer in charge. For instance, couture brands like Alexander McQueen puts a solemnity into this trend and it is done in the most divine way which in turn makes personalities like A-list actress Emily Blunt swear by their statement, red carpet gowns. Embroidered statement-making embellishments are being used forl intensive styling and DIY purposes too. You need not buy upmarket brands in order to get your hands on this trend when you’ve got businesses like Craft House Nigeria taking the very idea of embroidered embellishments and making them super-accessible to the masses. These bad boys take your outfit from zero to style hero with the least bit of effort. They have the capacity to pep up an otherwise plain outfit simply by pinning them on, sewing them in or purchasing pieces readily embellished with them. Just be careful not to overdo it by having too many on one outfit, lest you risk walking around looking like a vision board. A very strong case can be made for these accessories because they are genius. Should you have a shirt that has hung lackluster much longer than it should, or just an old item of clothing you’re not willing to breakup with, then embroidered embellishments are your go-to fix. Most notably, the embroidered rose is a favourite and a real looker as seen in the recent collection of Yoot by Henry Uduku. As accessories, you will need a collection of these new brooches and also want to wear them on every item of clothing you love, okay maybe just some items. Tis the month of ‘commercial love’ as I like to call it and nothing says romance quite like a few embroidered roses tastefully and strategically placed on the date night looks. Embroidered embellishments are dainty, character-infused, understated yet dramatic, and very fun accessories to play with. They do well to accentuate clothes, adding layers of depth and dimension to your unique style. Get in on the trend and see how these work for you.